Austin EcoNetwork has created community-driven data-rich tools to empower voters in Austin’s first 10-1 election. The Election Navigator link helps voters identify the strongest, most sustainability-minded candidates for City Council and Mayor. 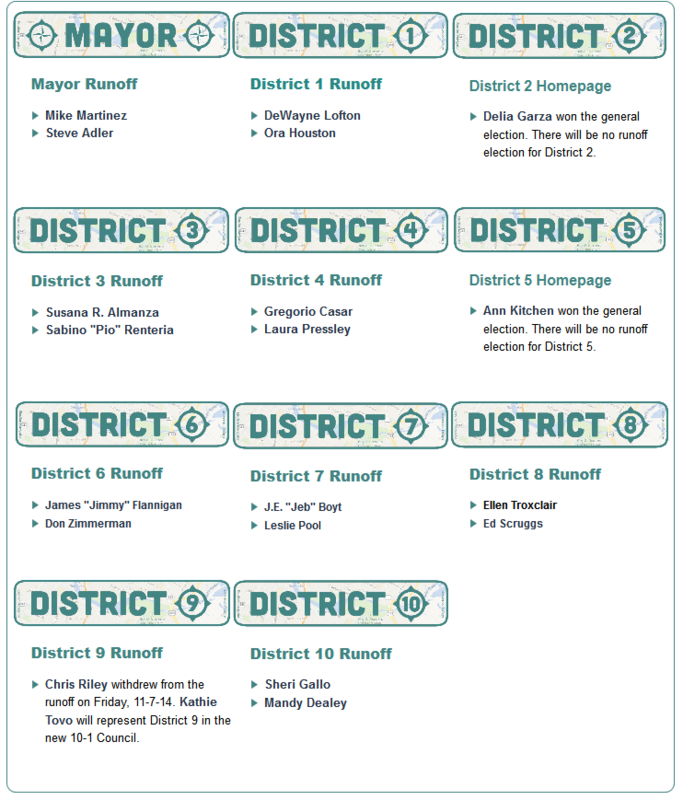 We had a great run in the general election and have already re-tooled the site for the runoffs. Producing this took months of surveying public priorities, wrangling data (some of it never-before-released), building tables, analyzing candidates’ answers to 5 different environmental questionnaires and writing summaries, designing infographics, conducting interviews and scanning candidates’ websites to gather their perspectives and priorities regarding water, energy, transportation, food & forest, zero waste, climate change, and general leadership issues. And then we had to do a bunch of if again - re-designing infographics, re-writing summaries and updating endorsements - for the 9 runoffs, which later became 8 runoffs after Chris Riley withdrew. SO HOW DO YOU #VOTE4ATX? I’m Brandi Clark Burton, and I’m passionate about connecting people with the information and resources they need to live rich and sustainable lives. Inspired by the opportunity we have this election, our team at Austin EcoNetwork has created the Election Navigator link, a free, searchable resource for discovering Austin City Council candidates' views and plans for the city. The Election Navigator offers a powerful set of tools never before available to voters. And now, we are looking to YOU to jump in and support this campaign which puts direct candidate information in the hands of voters, for the benefit of all voters (including you!). We have done the work to compile and make available rich multimedia information and have chosen to structure this project as an opportunity for citizens to fund the project. District Pride: Show your pride in your new district and your support for Austin EcoNetwork. 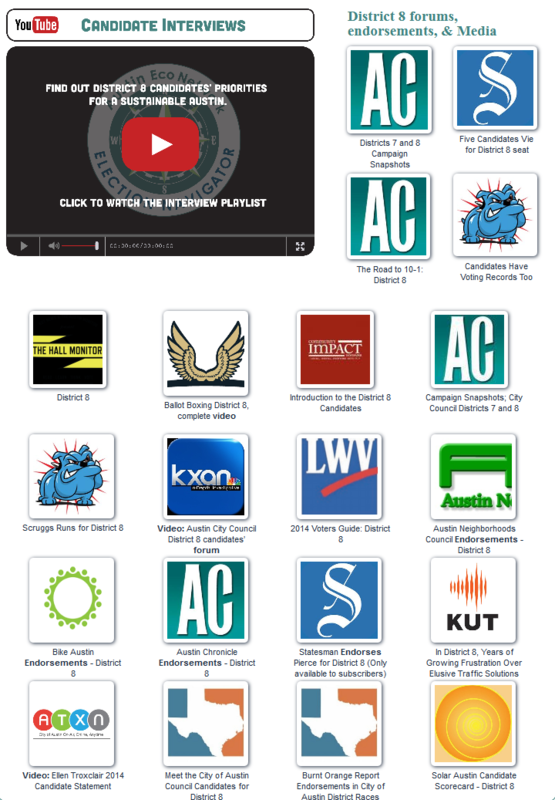 Get a limited edition District sticker, an AustinEcoNetwork.com sticker, and be thanked in the Austin EcoNews. Advertising: Promotion for your own or your favorite local green business, organization or event. The increased site traffic during elections is a great time to be showing up on Austin EcoNetwork.com before the holidays. Austin's electoral process is going through a re-boot, shifting to the new 10-1 geographic system of representation. We are in the midst of electing all ten city council members and a new mayor to lead Austin into the future. These leaders will be tasked with managing a billion dollar budget and all the realities associated with being the fastest-growing city in America. Austin leaders not only shape our communities, but in many categories, provide leadership for the world. CHECK OUT WHAT WE HAVE CREATED FOR AUSTIN! 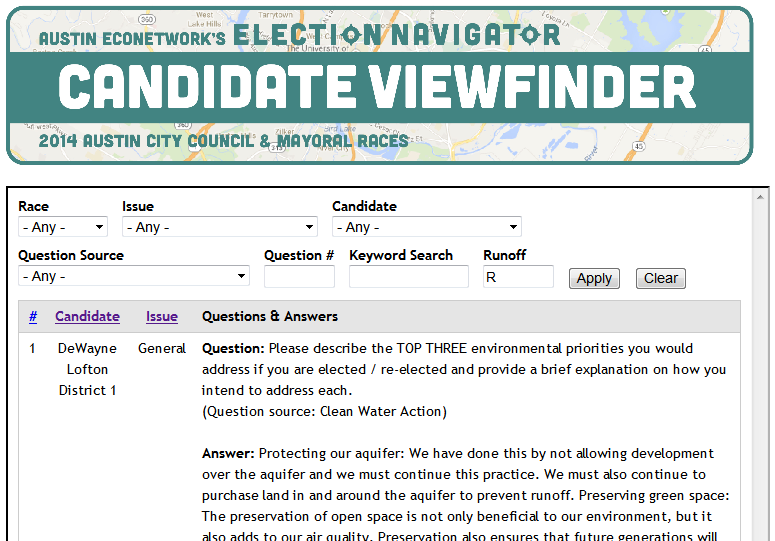 Candidate ViewFinder Tool - Allows usersto analyze the answers provided by the candidates to five different questionnaires issued by the Sierra Club, Clean Water Action, Clean Energy for Austin (a coalition of more than a dozen groups), Austin Environmental Democrats andAustin EcoNetwork. You can filter & sort Candidates in all races, 7 Issues, 56 Questions, 5 groups issuing questions, or search by keyword. On the original Election Navigator pages we created a page dedicated to the Mayor's race and each of the 10 District races. 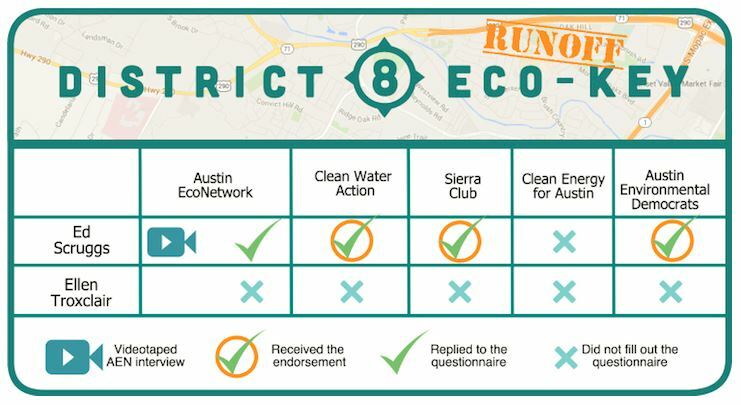 An infographic displaying, at a glance, who responded to the 5 different environmental questionnaires and who earned endorsements. * Playlist of Videos of candidate interviews featuring candidates from that race. 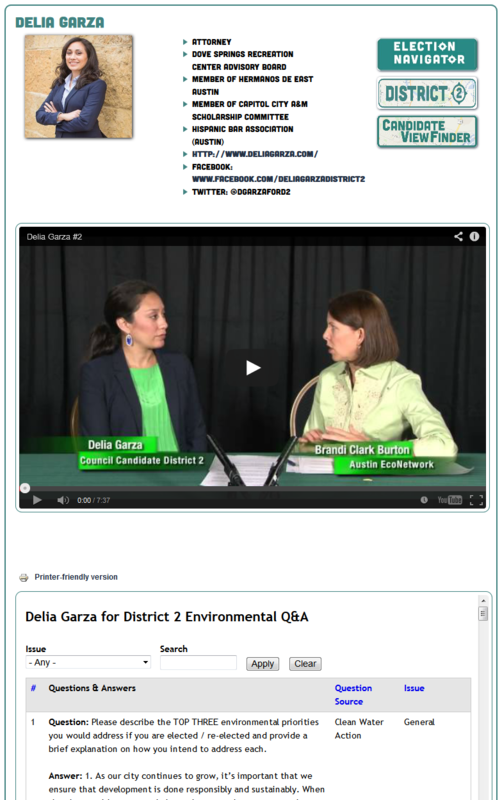 * Links to other media and videotaped candidate forums for that District/race. The issues we cover in depth include Austin's major utilities and infrastructure (water, energy, transportation and materials management in the form of zero waste) as well as life-sustaining and quality of life issues such as food and forest and climate change. We really believe that we are changing the face of democracy here in Austin, and that we're creating a fantastic model that can be replicated in citiesaround the world. 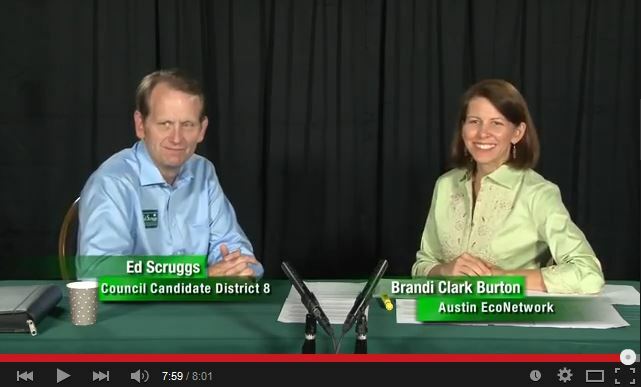 * Videos of one-on-one interviews of the candidates by Brandi Clark Burton asking them about their environmental priorities and visions for Austin. 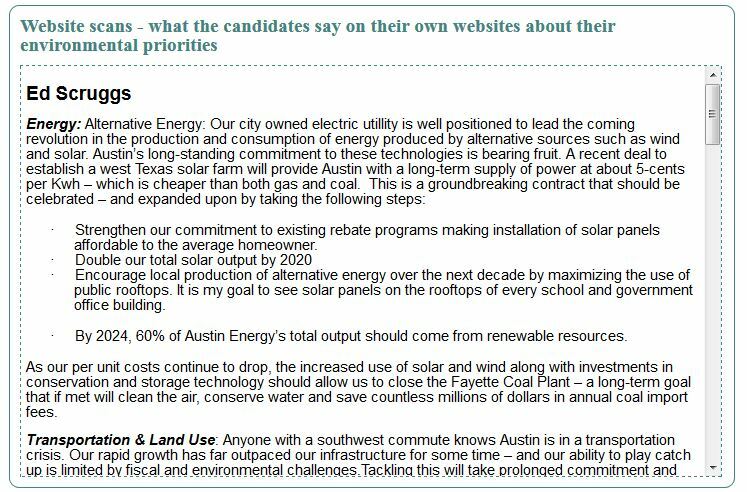 * Candidates' answers to all five environmental questionnaires from Sierra Club, Clean Water Action, Clean Energy for Austin, Austin Environmental Democrats and Austin EcoNetwork. Austin EcoNetwork's Election Navigator is your one-stop shop for figuring out who's who, beyond the sound bites, icluding the latest runoff information. We are committed to having the most comprehensive set ofresources, links and original content anywhere to help you make your 10-1 election selections. The Election Navigator has the potential to impact election by elevating the quality of voter decisions at the polls. Information direct from the candidates, readily available, without heavy editing, sound-biting or editorializing butwith the ability to see side-by-side how candidates articulate their views over many questions and across media channels. The Election Navigator will live beyond this season’s election, making it an historical repository and reference site. This will enable future candidates to easily mine and search for the best ideas of recent races and even remind candidates what they stood for during election season. We have not yet paid everyone who made this possible, so please, take a stand for transparency in elections and government. Make a donation and support the Election Navigator in any and all ways that you can. VOTE ! 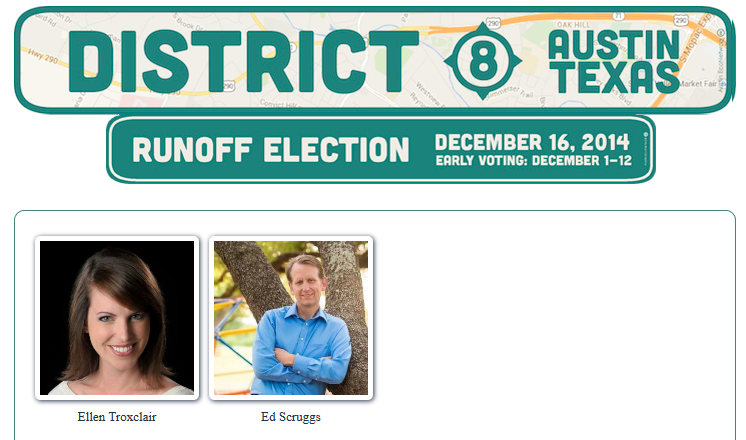 Use our tools and make an informed choice for your district and Mayor of Austin and VOTE!!!!! Please let others know about our campaign! Share the love on social media using the tag #Vote4ATX and tell all your friends about our Election Navigator resources as well as this opportunity to make a donation to improving civic engagement and voter turnout. We want this to be big! Austin EcoNetwork is the hub of the green scene in Austin, and was established to connect people with the resources and tools they need to make a difference in their personal lives, at work, in the community and in our local government. AEN is uniquely qualified to assemble this information. Everyone can benefit from our free information, calendars, and tools everyday by subscribing to the Austin EcoNews at www.AustinEcoNetwork.com, liking us on Facebook or following @AustinEcoNet on twitter. We do not take any cut or commissions from donors and fundraisers. Payments are securely made via PCI compliant payment processing partners of the fundraiser. AUSTIN ECONETWORK THANK YOU Gratitude + Insider list + Public thanks in one issue of the Austin EcoNews + Austin EcoNetwork bumper sticker. "1-HR OF WEB DESIGN Gratitude + Insider list + blog thanks on AustinEcoNetwork.com + District sticker (with YOUR district number). "GREEN BIZ/ORG/EVENT FEATURE Featured Blog and Newsletter Item for your favorite green business,organization or event in the Austin Eco News (to be used before end of year) + Name on the Election Navigator supporters page. ANNUAL PARTNER: ist your green company/org in the EcoDirectory in 3 categories and get monthly exposure to Austin EcoNetwork's audience. ANNUAL PARTNER PLUS: EcoDirectory sticky directory listings in up to 10 categories Our Partners logo display on AustinEcoNetwork.com 3 monthly exposures to Austin EcoNetwork's audience. TITLE SPONSOR Title sponsor of Election Navigator recognized on Supporters page and at Election Night reception. + Personal thank you note from Brandi. We understand that not all your friends will contribute online. Give your offline contributors due credit by listing their name and contribution amount below. The offline contributions will be listed under the contribution tab on your campaign. Each cent counts to make a campaign successful! Impact data was not accessed for this campaign. This is a private campaign. Please enter the provided password. This campaign has originated from India. Please select your preferred method of payment.